Every celebrity needs to download this app. 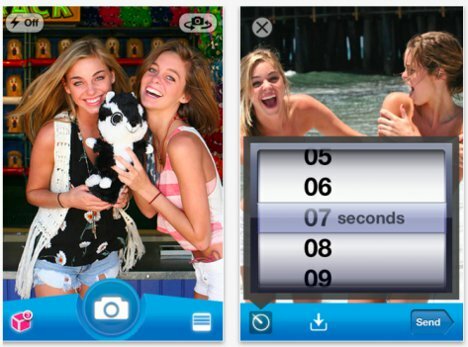 Snapchat for the iPhone lets you send all of the dirty, embarrassing, personal pictures you want – but the recipient only gets to view them for a few seconds. You set the time limit for up to ten seconds; this is how long your recipient will have to take in all of the filthy goodness of your picture. After that, the photo deletes itself from the second phone forever (you’ll still have to remember to delete it from your own phone). For tricksy texting buddies who try to take screen shots of the naughty pics, Snapchat has a built-in preventative. The app doesn’t allow the screen shot and notifies you so that you can scold the would-be cheater. The company behind the free app knows that adding barriers to poor behavior – like uploading an ex’s personal pics to a social networking site – can go a long way toward deterring some of that behavior. Of course, if you’re really worried about personal pics of you making their rounds online some day, the easy way to avoid it is to just not take them in the first place.